MISSION, KS--(Marketwired - Oct 10, 2013) - (Family Features) From rushed morning breakfasts to hurried dinners, the kitchen is often the busiest room in the home. But with all of this activity comes a world of messes. For busy moms, cleaning up spills and splatters can be a job in itself, especially when kids are involved. From installing kitchen features that make it easier for kids to help clean up, to easy ways to keep pans bright, these tips offer simple solutions for a range of kitchen mishaps and messes. Line the refrigerator: Hardened mustard or sticky soda spills can be hard to remove from inside the refrigerator. For quick clean up, line the drawers with plastic placemats. When a mess happens, just pull out the mat, scrub it off and place it back in. As a bonus, these mats often come in fun colors or patterns to help jazz up kitchen décor. Let the kids help clean: Many kitchen and bath manufacturers, such as Pfister, offer faucets with flexible, pull down spouts for kids to help clean and rinse dishes after dinner. Just be sure to invest in a sturdy step stool to keep your little helpers safe while they're at work. For more information, visit www.pfisterfaucets.com. 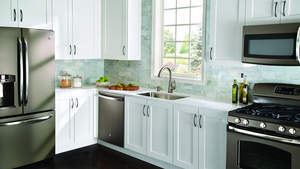 Clean with baking soda: Backsplashes and tile flooring can be cleaned in a breeze with a simple solution made from things you may already own. Just mix a half cup of baking soda into a two gallon bucket of water and scrub those splatters away. Brighten brass and copper: To clean up tarnish on pots and pans made with brass or copper, use a small amount of ketchup on a soft cloth and rub. Once the tarnish is gone, rinse with warm water and towel dry. Outfit with smudge-free features: With all the upkeep required in a kitchen, cleaning build up on the faucet can be a bothersome task. The new smudge-free Slate finish from Pfister retains its shine after being handled, even after little hands. Plus, its warm, grey metallic color blends perfectly with other appliance finishes. Remove countertop stains: Kids love their juice with breakfast just like mom loves her coffee, but little spills happen. To remove such stains, simply add a little hydrogen peroxide to water and a few small drops of ammonia and scrub with a soft cloth. With a few simple tools you'll be able to keep your kitchen squeaky clean so it can continue to be the favorite hang-out for the entire family.